It's a pleasant day in the city of Pergamon, and hundreds of people clog the streets for religious festivities or linger around the theatre trying to catch a glimpse of Emperor Hadrian visiting town. Pergamon is a prosperous town, no ruins are to be seen, and even the colourful frieze of Gods and Giants around the Great Altar is complete. In the middle of all this, several dozen journalists from the 21st century are gaping at the panorama. They stand on the 15 m high platform of a flimsy metal guard tower that shakes whenever someone comes up the narrow stairs. The whole town and its bustling life consist of 2500 m2 of printed polyester panels hanging in a purpose-built rotunda in front of the Pergamon Museum. In contrast to the grand panoramas popular around 1900, such as the Crucifixion Panorama in Altötting or the impressive Racławice Panorama now hanging in Wrocław, this one is not meant to be a permanent installation. It will only accompany the Pergamon exhibition in the Museum itself, which will be open for one year. And yet its creator, Yadegar Asisi, spent several years working on it. It may not be hand-painted like the older panoramas (except for the glow-in-the-dark parts), but since archaeologists had a say in every last detail of the crowded scene, a lot of research went into the computerised reconstruction of the setting. The exhibition beyond shows hundreds of finds from the antique city, many of them for the first time, plus some replicas of major statues found in Pergamon. The Pergamon exhibition and the Pergamon Panorama are open from 30 September 2011 until 30 September 2012 in the Berlin Pergamon Museum. „Icons and Souvenirs,“ proclaims a signboard in Russian at the small shop. Beside it is a handwritten cardboard sign in German: „6 postcards 1 Euro“. At the next stall someone tries to sell us a wacky St Nicholas fridge magnet for 1 Dollar. 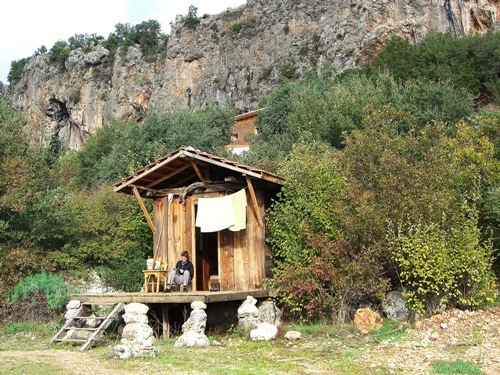 Myra, a small town in southern Turkey, gives a cosmopolitan impression. And indeed during the summer season every day up to 3000 tourists from all over the world visit Myra to see the place where St Nicholas spent his life. Myra was one of the biggest early Christian communities in Asia Minor. 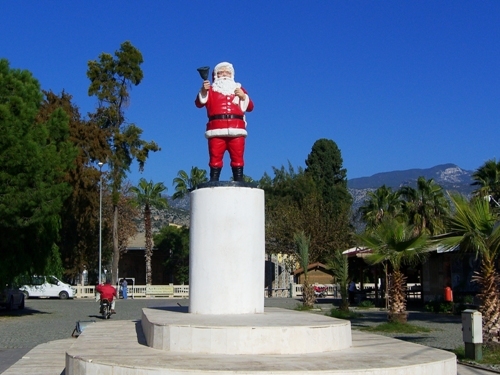 The historical St Nicholas is said to be born in the nearby city of Patara around the end of the 3rd century AD and after his ordination became bishop of Myra. His kindness and generosity, but especially his miracles, won him the admiration of his contemporaries. Among other things he rescued local sailors from a dangerous tempest, but his most famous deed did not require any supernatural skills: Secretly he gave enough gold to three poor girls to finance their dowry, thus saving them from prostitution. After his death, Myra quickly became a pilgrimage destination and Nicholas himself one of the most popular saints. He is the patron saint of children and sailors, but also of New York and Moscow. During the upheavals of the crusades, Italian merchants brought the relics from Myra to Bari, where they are still revered today. St Nicholas meanwhile merged with the northern European Father Christmas to an American-style Santa Claus. But Santa’s padded suit would definitely be to warm for Myra, where temperatures now, at the beginning of December, still reach 20 degrees Celsius during the day. 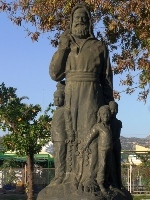 No less than three different statues of St Nicholas compete for the visitors’ attention. On a pedestal in the centre of town, a red and corpulent Santa Claus swings his bell. 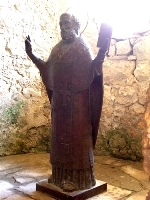 Until last year a bronze figure showing St Nicholas as an orthodox bishop had occupied his space. He was ousted by the American because of Santa’s higher “international recognition”. The orthodox St Nicholas, donated by the mayor of Moscow, has now found asylum inside the St Nicholas Basilica itself. Not far from it, the oldest statue in Myra looks like a 19th century German Father Christmas surrounded by a band of happy children. Turgut has wound a purple bandana round his head and is wearing a waistcoat with too many pockets. He and his workmen are just building the new entrance structure at the Southern side of the church where the roof is missing. In the past five years, the Byzantine frescoes in this part have been restored, and the walls are provisionally canopied with plastic sheets. Due to the construction work, the area is still off limits. “Here you see St Constantine and his mother, St Helena,” the German guide explained to his group in one of the byzantine rock-churches of the Open Air Museum in Göreme. “And these are Ali and Kemal again, the bad boys.” He pointed to the graffitti on the red and black geometric pattern over the entrance. As in China, we were shocked by the vandalism at many sights in Turkey, the Christian ones in particular. In Ani for example, the old Armenian capital that is now on the Turkish side of the border, the only well-restored building was a Seljuk palace, while the Christian Armenian churches were left to decay - and to the Alis and Kemals. “Armenians? We had no problems with them until the Russians intervened!” That was in the 19th century. Mehmet and his brother Taran had clear opinions about the Turkish- Armenian relations. 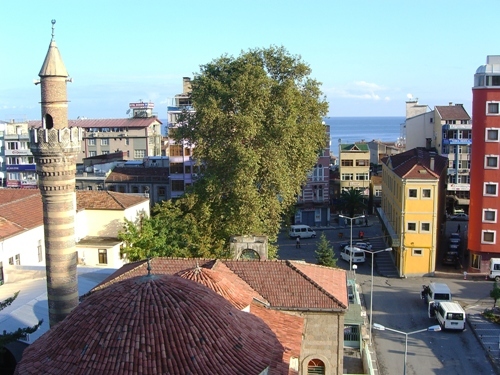 While we were in Anatolia, the Nobel Prize for Literature was awarded to the Turkish writer Orhan Pamuk, whose book Snow mentioned atrocities against Armenians. “I used to like Pamuk’s books,” Taran exclaimed, “but not anymore! He has two faces.” That Orhan Pamuk has written Snow just in order to gain international fame seems to be the predominant opinion. In bookstores, the books of the Nobel Prize laureate are not easy to find, and it took us several weeks to get hold of an English copy of Snow. Officially, Turkey is a secular state since the revolution led by Mustafa Kemal Atatürk. At least in Anatolia, it does not appear as such. In the modern airport-like bus terminal in the capital city of Ankara, the Muezzin’s call for prayer is broadcasted over the main speaker system. The pompous personality cult of Atatürk himself largely ignores the secularism he introduced. For instance, Atatürk outlawed the traditional brimless hat that can be worn for prayer [thanks, Ursula] – but an older picture showing him with just such a hat is almost as ubiquitous as the more Westernized “1920s magician” type portrait with the piercing eyes. Although women have the same rights on education and job, Turkey is a very male dominated society. During the seven weeks we spent in Turkey we almost exclusively spoke with men, and in the Anatolian countryside we saw no woman without a headscarf. We are still not sure whether or how much we like the country. Turkey has an amazingly rich cultural past, and we both enjoy exploring Hittite and Urartian castle sites and marvel at the Seljuk Islamic mosques, madrassas and mausoleums. We are also quite surprised by the geographical diversity of the landscape. On the other hand we never found travelling as exhausting as in Turkey, and for the first time in all these months we worried about safety and security on the street, in hotel rooms etc. Some people are extraordinarily friendly, but we also had more bad encounters and rip-offs than in other countries. Yet every other day we are asked: “What do you think of the Turkish people and of Turkish hospitality? Don’t you think Turkey more beautiful and much nicer than Germany?” Often the people who ask are nice enough but we are weary of confirming preconceptions and at the same time regret being critical of a country that feels so close after years of living in Berlin. Perhaps we will get different impressions at the culturally quite different coast. In Antalya we have finally reached the Mediterranean, and suddenly the sightseeing spots are Graeco-Roman, couples hold hands, and oranges grow in the streets. Depending on the weather we will spend some more days climbing and hiking at the coast and then travel southwards around the sea to Egypt via Syria and Jordan. For nearly an hour we have plodded up the mountain, sometimes sinking into the snow up to the knees. 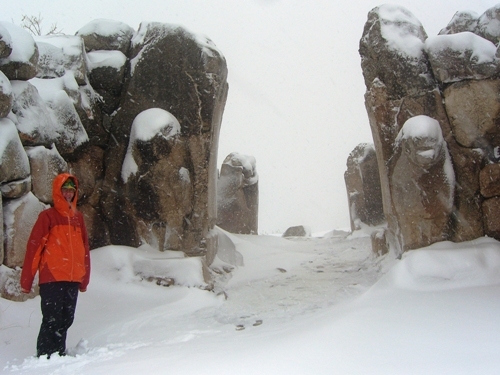 Suddenly a gate made from huge blocks of stone appears in the heavily falling snow. Every stone is hewn in a different shape so that they fit perfectly. “This must be the Lion Gate.” And indeed two huge stone lions sit on the door-step and stare in the distance to keep evil influences and evil men at bay. The portal figures are two of the few original sculptures left at the archaeological site of Hattusha, the ancient capital city of the Hittites. Hattusha was only rediscovered in 1906 by the German archaeologist Hugo Winckler, and the walls and their gates were among the first structures he found. We make our way along the old city wall to the Sphinx gate, which sits 10 m high up on the rampant wall. Of the four sphinxes guarding this southernmost gate, only three have survived the ages, and just this one has remained in Hattusha. One sphinx is in the museum in Istanbul, another one in the Pergamon Museum in Berlin, where it mysteriously got an inventory number after being sent there for restoration – and never found its way back to Turkey. “In the 19th century, Turkey was one of the first countries to introduce a law forbidding foreign archaeologists to remove their finds from the country.” The next day, we are lucky enough not only to have a blue sky but also to meet Andreas Schachner, the German excavation leader of Hattusha. He has taken a day off to take some photos of snow-covered Hattusha and offers to take us along in his 4WD. His predecessors at the German Archaeological Society have dug at Hattusha, near the village of Boğazkale, for 100 years with only brief intermissions. “Depending on our funding we can dig between two and four months each summer,” Schachner tells us. Until Hugo Winckler came to Hattusha, almost nothing had been known about the Hittite empire. The 2500 cuneiform tablets of an ancient library he found were written in a language that nobody understood. But once they had been deciphered (by B. Hrozný), a vivid picture of a powerful empire emerged. Archaeologists believe that the Hittites spoke an Indo-Germanic language and may have immigrated to Anatolia from Europe. Building up a strong army and transforming their capital to an impregnable fortress, by the 14th century BC they became one of the greatest powers in the Middle East, besides Egypt and Mesopotamia. They once ransacked Babylon and in 1274 BC clashed with the Egyptian troops of Pharaoh Ramses II in the Battle of Khadesh in today’s northern Syria. The battle ended with a narrow victory for the Hittites, resulting in the world’s first known peace treaty, the Treaty of Khadesh. A copy of it adorns the wall of the UN Headquarters in New York. Up to now, more than 30 temples have been discovered, as well as the king’s palace, several fortresses and some houses of the old town in the lower part of Hattusha. However, much is still unknown about the vast Hittite empire – especially its end. The Hittites seem to have disappeared from the historical stage quite suddenly. The unexcavated areas may hold some cues. And … there is still the top prize to be won: the royal tombs. In the Soviet style hotels in Central Asia, every floor has a floor lady who guards the keys and may or may not hand out toilet paper and extra blankets, depending on her mood. One morning in Taraz, Isa ventured into the floor lady’s room to ask for hot water to make us some coffee (well, instant coffee). The rusty old kettle was not on, but another hotel guest, a lady with a single hair curler in her fringe, was just walking away, presumably fetching water for the kettle. After a short while she came back with a shiny new electric kettle and gestured towards Isa to fetch water. Meanwhile, a stout woman in a morning gown appeared with her cup and a used tea-bag. She turned out to be one of fringe-curler’s room-mates who wanted an extra cup after the group had returned the borrowed electric kettle. [….] 20 minutes later, when our coffee was ready, we knew all the guests on the second floor. The next day, we bought a tiny immersion heater “made in Taiwan” that takes just over two minutes to make a cup of hot water. It cost only 60 cent and is an addition to our luggage we don’t want to do without anymore, although we now sometimes spend our time holding a cup of water close to the only socket in the room that is high up in the wall. · Salt and pepper, oat meal, raisins and nuts (for breakfast in hotel rooms). Although we love (almost) every day of our travel, there are of course a few things we do not like about travelling. We miss to cook our own food (and compromise by self-catering a lot) and yearn for good conversations with other people. 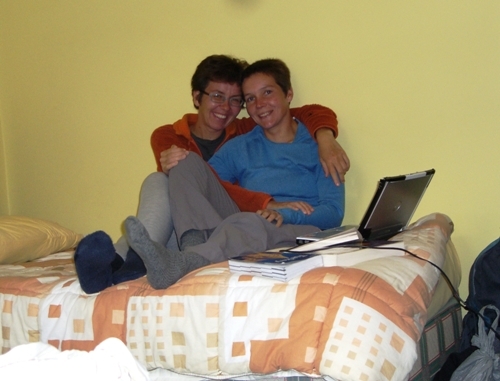 Many of the travellers we have met tend to talk about how cheaply they managed to stay, where, and for how long. “And the people were so friendly!” We earn astonished looks when we mention corruption, dictators, or political discontent that may not be immediately visible. Perhaps we do miss political science, after all (although not work!). In Trabzon, shortly before sunset, the streets are eerily deserted. In the distance we see someone rushing across the square, a parcel of two or three flat breads tucked under his arm. In the restaurants every place is taken. People sit at richly laid tables, fill their glasses and play nervously with their mobile phones. Suddenly a cannon shot raptures the silence, followed immediately by the muezzin’s call. Simultaneously everyone starts devouring their meal. 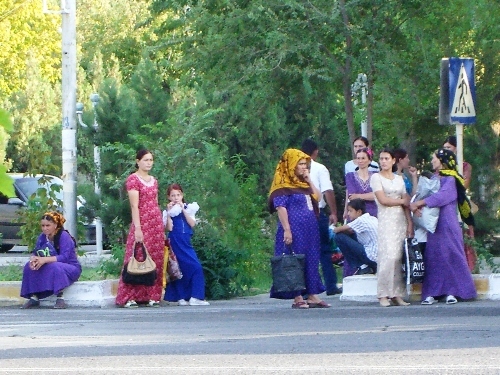 By far most people in Anatolia strictly observe the Ramadan rules: no food, no drink, and no smoking during the daylight. As it feels neither polite nor enjoyable to eat while everyone else is fasting, we decided to join. We cheat by having breakfast long after dawn in our room and by drinking water during the day. But even so by the late afternoon we are also hungrily waiting for the canon shot. As you may know we started our journey through Turkey in Trabzon and went in a half circle via Mount Ararat and Lake Van to south-eastern Anatolia. Between Trabzon and Van, we practically never saw anyone except foreigners, travellers, and children eat during the day. Further south, we had expected even stricter adherence to the rules, but the Western fast food restaurants of Diyarbakır were busy at noon. “It’s a big city and far less fanatic than Erzurum or Van!” Ramazan, an official in the tourist information, was all too happy to answer our questions. Diyarbakır hasn’t seen many tourists in recent years due to the strong presence of the Kurdish resistance movement (PKK). Despite having read several negative accounts of the area, we were eager to see the Islamic architecture. We got our first impression of the situation on the long distance bus. At the province border, soldiers collected the passports and thoroughly searched the bus and all luggage. When we arrived, the city looked at first glimpse merely more oriental than other Turkish towns and reminded us of Central Asia. Then we noticed the police squads, the soldiers with machine guns, the fighter planes roaring overhead, and scores of very aggressive street children, many of them “shooting” around with plastic guns. Posters of stone-throwing children, gunmen, and of Ahmed Yassim are openly displayed in shops and stalls. During the two days we spent in Diyarbakır we were once tricked into a wrong bus and experienced one attempted baklava theft by a child and one unpleasant incident with three young men who followed us on a country road towards the Tigris. Gradually they started to harass us, pushing, grabbing at our belongings and trying to block our way back. Yet back in the city, about 20 minutes later, two different shop owners refused to take money for their goods, and elderly men chased pushy boys away from us. During the 1980s and ’90s many people fled the surrounding villages to escape the arbitrary harassments of the PKK and the Turkish army. A lot of them are still jobless and without perspective for the future, leading to immense social problems. Although the conflict is subdued today, we still felt the political struggle: On the one hand, a minority sustains the atmosphere of threat and instability that makes tourists feel unwelcome. On the other hand, “the vast majority of people here are embarrassed by the situation”, as Ramazan explained, and their hospitality is also a political statement against the conflicts of the past.